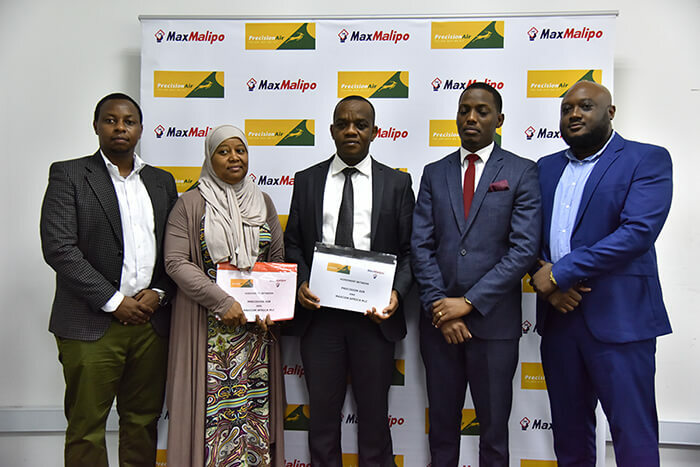 Tanzanias leading Airline Precision Air has announced its partnership with Maxcom Africa in providing payment platform for electronic ticket purchase. The partnership will provide Precision Air customer’s with flexibility in purchasing flight tickets conveniently through different payment platforms such mobile payments, Banks and Maxmalipo agents. Commenting on the partnership Maxcom Africa, The Country Director Mr. Charles Natai said precision Air is a Strategic partner to Maxmalipo and via this Partnership precision Air Becomes the first Airline to have over 16000 tickets pay points across the East Africa region. The partnership will allow Precision Air passengers to pay for their tickets through all mobile phones payment platforms, Banks and through 30,000 Maxmalipo agents across the country. Precision Air Services was established in 1993 as a private charter air Transport Company mainly providing connections to tourists visiting the rich natural attractions of Serengeti National Park, Ngorongoro Crater, in northern Tanzania, the Zanzibar Island in the Indian Oean and other parts of the country from Arusha town as its base. Currently headquartered in Dar Es Salaam it has grown to become a reputable airline in East Africa and Africa at large. Operating from Dar es Salaam with flights to Arusha, Bukoba, Kilimanjaro, Mtwara, Mwanza, Tabora, Zanzibar and Nairobi.